Entirely customizable, this full day tour with guide and private transport is our most comfortable tour option. Designed to make the most of our private transport, it focuses on the sites that are farther away from the center and just offers a quick overview of the pedestrian-only areas of the Old Town: enough to make you familiar with what is where. This is the perfect option if you want or have to keep walking to a minimum, if you are staying off central Barcelona, need to be picked up and dropped off at a cruise ship or if you are staying only one day and want to make the most of it. 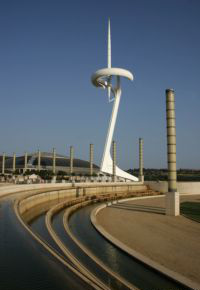 Montjuic Hill: Olympic site and scenic drives; the views are just impressive! The feel: Sit back, relax and enjoy the VIP treatment: cover the most ground in the most comfortable way. These amounts are for the whole party (1 to 2 and 3 to 6), not per person; they include: vat (taxes), private transport by Mercedes sedan or minivan with separate driver and a licensed tour guide for up to 8 hours. Extra charges for the Airport or hotels out of town according to distance. Prices do not include your entrance fees at optional interior visits nor lunch (to be arranged according to your preferences). Our recommendation: Sagrada Familia : 18 Euros per person (or 16 Euros for students until 18, 14 Euros for seniors over 65; free entrance for children under 11 and our guide) and Sant Pau Art Nouveau site: 13 Euros per person (9.10 Euros for students under 29 or seniors over 65. Or just send us an email with the information asked in the form below if you only want to make an inquiry rather than a reservation. At what time? For morning tours, we recommend early (8:30h or 9:00h) departure in order to do some of the important sites before they get too crowded. Do you need to be dropped off at a specific location at the end of the tour? The Dual Barcelona tour does not have transport in the afternoon, which must be spent visiting the pedestrian-only areas of the Old Town. 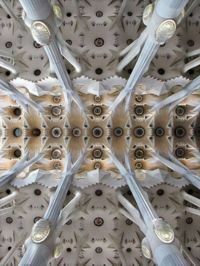 This is the ceiling of the Sagrada Familia: imagine the st of it! The Olympic site is also a showcase of contemporary architecture: Calatrava's cell tower. 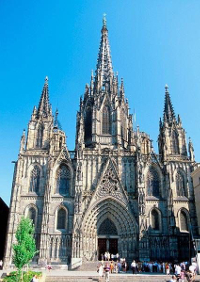 The Cathedral of Barcelona has been the main center of Catholic religious life since the 4th century AD.